Not to be confused with Number theory, a branch of Pure mathematics. 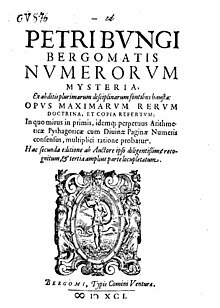 Pythagoras and other philosophers of the time believed that because mathematical concepts were more "practical" (easier to regulate and classify) than physical ones, they had greater actuality. St. Augustine of Hippo (A.D. 354–430), wrote: "Numbers are the Universal language offered by the deity to humans as confirmation of the truth. "[dubious – discuss] Similar to Pythagoras, he too believed that everything had numerical relationships and it was up to the mind to seek and investigate the secrets of these relationships or have them revealed by divine grace. See Numerology and the Church Fathers for early Christian beliefs on the subject. There are various systems of numerology that use the Latin alphabet. Different methods of interpretation exist, including Chaldean, Pythagorean, Hebraic, Helyn Hitchcock's method, Phonetic, Japanese, Arabic and Indian. Next, add together all of the numbers associated for each letter in your full birth name. Then, the number is reduced until you obtain a single number. Then, Jim Duncan Halpert’s name number is 5. A quicker way to arrive at a single-digit summation (the digital root) is simply to take the value modulo 9, substituting a 0 result with 9 itself. As mentioned before, the single digit then arrived at is assigned a particular significance according to the method used. When someone changes their name they will get a new name number. This is believed to change certain parts of the individual’s personality and destiny. Next, the birth number is viewed as an extension of the name number. This number represents the traits/talents that you desire to have. It is believed that your birth number reveals your inner nature and life purpose. To find your birth number you add together all the numbers in the month, day, and year you were born. Then, you reduce that number to a single digit number. Example: Assume James Duncan Halpert normally goes by Jim. Then, Jim Duncan Halpert’s name numbers are 6, 6, and 1. 四 [sēi] – considered unlucky since 4 is a homophone with the word for death or suffering 死 [sěi], yet only in the Shanghainese, it is a homophone of water (水) and is considered lucky because water is associated with money. There have been a few examples of numerology that have led to theories that transformed society: see the mention of Kirchhoff and Balmer in Good (1962, p. 316) ... and one can well include Kepler on account of his third law. It would be fair enough to say that numerology was the origin of the theories of electromagnetism, quantum mechanics, gravitation.... So I intend no disparagement when I describe a formula as numerological. When a numerological formula is proposed, then we may ask whether it is correct. ... I think an appropriate definition of correctness is that the formula has a good explanation, in a Platonic sense, that is, the explanation could be based on a good theory that is not yet known but ‘exists’ in the universe of possible reasonable ideas. ^ Valeri, Valerio. "BONGO, Pietro in "Dizionario Biografico"". www.treccani.it (in Italian). Retrieved 13 January 2017. ^ a b "The Skeptic's Dictionary: numerology". Skepdic.com. Retrieved 31 August 2012. ^ Lynne Kelly (2004). The Skeptic's Guide To The Paranormal. Allen & Unwin. ISBN 1-74114-059-5. ^ Η Ελληνική γλώσσα, ο Πλάτων, ο Αριστοτέλης και η Ορθοδοξία (in Greek). Acrobase.gr. Retrieved 31 August 2012. ^ Αγαπητέ Πέτρο, Χρόνια Πολλά και ευλογημένα από Τον Κύριο Ημών Ιησού Χριστό (in Greek). Users.otenet.gr. Retrieved 31 August 2012. ^ Holcombe, A.D. (1 January 1997). "Biblical Numerology Confirms the Spiritual Validity of Its Contents". Journal of Religion & Psychical Research. ^ "Abū Mūsā Jābir ibn Ḥayyān | Muslim alchemist". Encyclopedia Britannica. Retrieved 17 January 2018. ^ Campbell, Florence (1931). Your Days Are Numbered: A Manual of Numerology for Everybody. DeVorss & Company. ISBN 0-87-516422-6. ^ Maurice Townsend (1993). "Numerology: An Experiment". Retrieved 15 July 2018. ^ "Numerological research and its results". sharpthinking.com. 2 August 2012. Retrieved 15 July 2018. ^ Schimmel, Annemarie (1993). The Mystery of Numbers. Oxford University Press. ISBN 0195089197. ^ Jastrow, Joseph (1933). "Science and Numerology". The Scientific Monthly. 37 (5): 448. ^ Sharp, Damian (2001). Simple Numerology: A Simple Wisdom Book. Conari Press. ^ Heydon, David (2007). Numerology. Sterling. ^ Lagan, Heather (2012). Chaldean Numerology for Beginners: How Your Name & Birthday Reveal Your True Nature & Life Path. Llewellyn. ISBN 9780738726243. ^ "5G - Frame Structure - 5G - ShareTechnote". www.sharetechnote.com. ^ "Colorado University" (PDF). Archived from the original (PDF) on 16 July 2012. Retrieved 31 August 2012. ^ "fine-structure-constant.org". fine-structure-constant.org. Retrieved 31 August 2012. ^ I. J. Good (1990). "A Quantal Hypothesis for Hadrons and the Judging of Physical Numerology." in G. R. Grimmett (Editor), D. J. A. Welsh (Editor). Disorder in Physical Systems. Oxford University Press. p. 141. ISBN 978-0198532156. ^ "Number Symbolism – Myth or Reality?". CasinoObserver.com. Retrieved 6 March 2013. ^ Rowling, J.K. (1999). Harry Potter and the Prisoner of Azkaban. Scholastic.